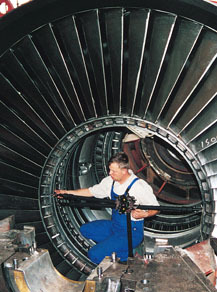 CENTRALIGN ULTRA EXPERT has been specifically developed for alignment of steam and gas turbines. The system is used for precise alignment of internal elements such as bearing rings, diaphragms, nozzles, inner shells and turbine casings; with upper halves installed or off, for distances up to 133 feet. CENTRALIGN ULTRA EXPERT assures true bore center measurement and reveals bore out of roundness. User independent measurements can be started at any position and performed in any direction. 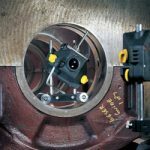 The ability to measure more than three points guarantees better accuracy and does not limit measurement points to specific clock positions. 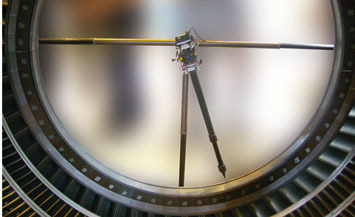 Stable wireless data transmission ensures reliable and complete data transfer of information between the measuring sensors and the ROTALIGN ULTRA COMPUTER. Over long distances and extended measurement periods laser stability is subject to fluctuations through variations in air density or temperature. To ensure measurement accuracy, an additional fixed sensor constantly monitors the laser drift at the far end of the machine and automatically adjusts readings to compensate for such drift. It will also warn the user should the drift exceed user defined limits. CENTRALIGN ULTRA EXPERT calculates the true center position of all individual elements and displays their location relative to each other, or to a specific reference line. The desired centerline may be adjusted to determine the best fit line thus minimizing corrections. The configuration can be tailored to meet the unique demands posed by a particular job and predefined values can be entered to compensate for rotor sag, tops on to tops off movement, and more. The particular bore type (i.e., bearing, diaphragm, oil deflector), as well as choice of correction method (i.e. ; centering pin, shim), can be established for each bore. Add and group new or existing bores as subassemblies (i.e., inner shells) within A MACHINE (outer shell). 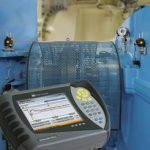 Monitor real time corrections on single elements, subassemblies, or machines. The CENTRALIGN ULTRA EXPERT system brackets are specifically designed for ease of use, flexibility and extremely high accuracy. Brackets can be INSTALLED in magnetic and non-magnetic bores and in tops-on and tops-off configurations. The brackets can be inserted in bore diameters from 4.75” to 166.5”. Final measurement results, to ISO 9000/MIMOSA standards, can be documented and saved as a PDF report directly from the ROTALIGN ULTRA COMPUTER to a memory stick.